In May of 2009, my boyfriend, who I had been living with for the past year, bought plane tickets for us to fly to San Diego to visit his mother and his sister who was about to have a baby. His mother spent the week showing us all the beautiful things that there were to see in the city. She took us to the San Diego Museum of Art because she knew I was an art student. I began to cry when I saw a painting by Pierre Bonnard that I had wanted to see for years, and turned to my boyfriend, expecting to share this moment with him. He looked at me, and turned around and left the gallery. This was the moment I knew I did not love him, and had never loved him. I stayed with him for another four months before we broke up. 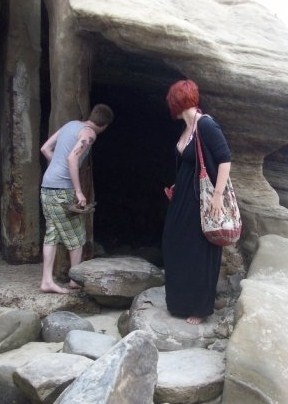 This is a picture of us at La Jolla cove, the day after we visited the art museum. It is the most beautiful place I have ever seen. I am still angry that he is the one I share that memory with.